Mobility on Demand Market size was over USD 100 billion in 2017 growing at CAGR of over 10 percent from 2018 to 2024. Increasing urbanization and rising population have resulted in an exponential growth in the vehicle fleet size in the last few years, due to which many cities are witnessing a swelling pressure to tackle air pollution and traffic congestion problems. Growth in the working population has boosted the need for time-reliable solutions. Therefore, rising pollution from vehicles coupled with increasing traffic issues has led to the rising awareness of the mobility on demand market concept. The integration of real-time data, transit networks & operations, and co-operative smart transport systems provide enhanced transportation options to all users in a safe and efficient manner. Increasing government initiatives to curb the rapidly increasing automotive population, traffic congestion issues, and hazardous gas emissions are expected to boost the mobility on demand market growth. Several government organizations are encouraging the use of shared vehicles instead of owning them. For instance, in December 2017, Singapore announced the launch of the electric car sharing project to prevent growth in its car population and encourage the citizens to use public transport options. Such stringent regulations pertaining to hazardous gas emissions are encouraging several companies to invest in the MOD market. Dependence on cloud computing exposes the system to security breaches and cyber-attacks. Frequent hacking of connected vehicles and traffic signals is challenging the mobility on demand market growth. However, cybersecurity companies and educational institutions are investing in developing solutions to curb these potential threats. For instance, Argus Cyber Security, an automotive cybersecurity company has partnered with Renovo, a mobility software technology to develop advanced cybersecurity solutions for MOD market. The ride hailing market is expected to grow at a CAGR of over 15% as it utilizes GPS to reduce the taxi waiting time. The service ensures faster and more convenient travel mode as it offers first and last mile connectivity to passengers. Moreover, government support for e-hailing services to improve the public transportation infrastructure is expected to boost the mobility on demand market growth over the forecast timespan. Enhanced safety is a benefit for drivers working with e-hailing services. Moreover, e-hailing application users enjoy the flexibility of hailing a car from any location and have the car ready within minutes of time. The car sharing market is projected to grow at over 30% CAGR over the forecast time span owing to the growing traffic congestion problems and the rising government initiatives supporting the shared vehicle trend. While car sharing economy offers conducive conditions for start-ups and attracts venture capital investors, established players in the automotive industry, both car rental businesses and OEMs, are showing growing interest in the sector. In December 2017, Singapore announced the launch of its electric car sharing service. The subsidiary of the French company Bollore Group, BlueSG, undertook the scheme with 32 charging stations and 80 cars. Mobility on demand market for business applications accounted for over 70% of the global share in 2017 and is anticipated to remain dominant over the coming years. Problems relating to vehicle parking spaces in metropolitan cities will contribute to the industry growth. Moreover, the industry is anticipated to gain traction as it enables commercial businesses to minimize or eliminate the size of private vehicle fleets by offering employees the access to shared vehicles. Flexibility and ease-of-operation through improved mobility are projected to drive the adoption of these services for business applications. Mobility on demand market for private applications is expected to grow substantially owing to the rising demand for enhanced public transportation systems in countries such as India, Singapore, and several western European countries. An increase in the standard of living of people in developing economies has led to a rise in the demand for sophisticated transport solutions, thus propelling the growth of car rental market. The growth of travel & tourism industry is positively impacting the adoption of these services. The tourists are demanding individual and personalized transport for enhanced experience and comfort. The Asia Pacific mobility on demand market is expected to witness a strong growth in car sharing service segment, which is expected to reach over USD 2 billion by 2024 owing to the rapid urbanization in economies including India and China. China is witnessing increasing pressure to tackle traffic congestion and air pollution problems while India is facing problems pertaining to weak public transport infrastructure. Government organizations in India, China, Malaysia, and Singapore are stressing on undertaking measures to solve the traffic and pollution issues. The local governments of Qingdao, Shenzhen, Shanghai, and Beijing are supporting the adoption of services by offering parking lots and adding cars. In October 2015, the State Council encouraged the automotive manufacturers to develop and implement car sharing market services in the country. The Europe MOD market is expected to witness growth at approximately 9% CAGR owing to the advanced automotive sector of Germany and the presence of key players such as BMW Group and Delphi Automotive PLC. Flinkster is a station-based car sharing provider, which exclusively operates in Germany. In June 2017, Delphi announced a strategic partnership with Transdev with an aim to develop a fully automated and intelligent transport system. 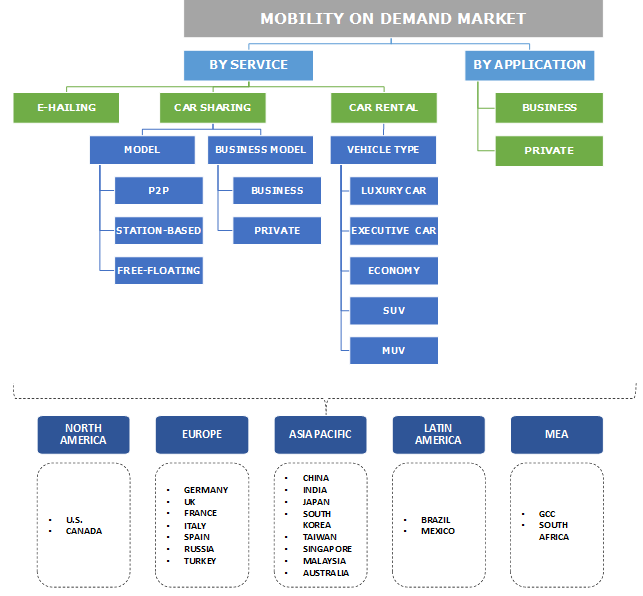 Key players operating in the mobility on demand market include Toyota Motor Corporation, Delphi Automotive PLC, Intel Corporation, International Business Machines Corporation, Uber Technologies Inc., BMW AG, Robert Bosch GmbH, General Motors Company, and Ford Motor Company. Companies are trying to launch innovative solutions by incorporating the latest advanced technologies. Automotive manufacturers are facing mounting pressure due to reducing car ownership. Increasing popularity of these services is compelling companies to enter the industry either by establishing subsidiaries that offer these services or by collaborating with existing players in the mobility on demand market. In March 2018, General Motors announced that the company is delivering its car-sharing service to Austin for drivers for ride share apps such as Lyft and Uber, and on-demand delivery apps. In December 2017, Nissan announced the launch of the car-sharing company e-share mobi in Japan with an aim to enter the car-sharing market. Technological advancements in the automotive sector are expected to transform the mobility on demand market. Increasing penetration of smartphones and the growing proliferation of digitalization have led to a rise in the demand for these services. App-based car sharing is gaining popularity owing to the convenience offered by the technology. Rising traffic, increasing population, and rising environmental concerns are compelling organizations to find enhanced mobility solutions. Improved communication technologies have further boosted the mobility on demand market. Restricted parking spaces are leading to mounting pressure to reduce the number of self-owned vehicles. E-hailing service providers deliver several features, such as reduced costs and increased quality of services, that bring economic benefits to customers.